The Goddess Girls books by Joan Holub & Suzanne Williams all feature one goddess, in the case if the first book in the series, that’s Athena. Athena lives with her best friend Palles, and she doesn’t know who her parents are. Then one day she gets a letter from Zeus, her father, saying that she must go to Mount Olympus Academy and start her training as a goddess. This book is quite clearly meant for girls that have just learnt to read. 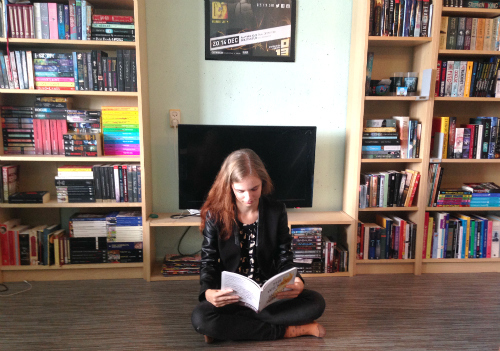 The pages contain very little words, and the story is very easy to follow and short. Still, as someone who is significantly older than the intended reader, I still had tons of fun reading this little book. There are so many details that make the book incredibly funny, at least, if this is your kind of humour. I, for example, thought it was hilarious that Zeus is a very, very bad sculptor. Don’t expect the story to be mythologically correct. The authors take quite some liberties with the myths, but I personally didn’t mind at all. Greek mythology is quite gruesome, and I don’t think that would be appropriate for the younger audience. I found it very interesting to see which fact they kept, and which they changed. One important part of writing for children is the message you send across – children often can’t tell if a story is meant ironically or literally. Especially in YA this is often ignored, and there are thousands of girls out there waiting for that one wonder-boy that will swipe then off their feet and make their life perfect. I didn’t have any objections at all to the message of Athena the Brain. The story touches themes such as friendship and loyalty, without being preachy at all. It also helps that Athena is amazingly smart, and does all her homework and doesn’t fall in love with the first boy she sees. 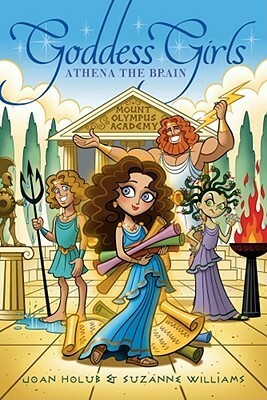 I absolutely loved Athena the Brain, and I can’t wait to read the next Goddess Girls book.